A contributing factor in keeping older adults healthy is the physical characteristic of their environment. A growing number of studies reveal the integral relationship between seniors and their physical environment in fostering mobility. One key component of the Miami-Dade Age-Friendly Initiative is The Safe Routes to Age in Place (SRTAP) program what has focused on fostering local, accessible, safe, comfortable, and convenient transportation options across all adult age groups and abilities in a diverse community. SRTAP was designed with a 5 “E” model that incorporates a multisectorial approach utilizing: Engineering, Education, Encouragement, Enforcement, and Evaluation. The program involved community engagement as well a Virtual Advisory Committee, a CDC-HAN Environmental Audit, and meetings and review of findings with key agencies to review findings with local older adults. This program was piloted in the predominantly Cuban populated neighborhood of Little Havana. Little Havana was selected through a criteria analysis based on three primary factors: Safety (determined by elderly pedestrian crash density), Density (determined by elderly population density), and Need (determined by percentage of households with no vehicles available). Additionally, a confirmation factor of readiness was used to narrow down the pilot location for Safe Routes to Age in Place. 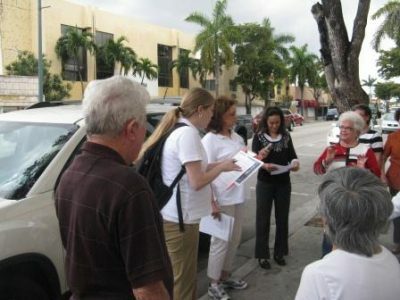 Little Havana has a large number of adults 65 and older do not own a car and their pedestrian crash rate was more than five pedestrian crashes per square mile per year. As a follow up to this initial project, an Age-Friendly Business District was developed within the same area to encourage older adults to walk to resources they need and increase physical activity. Other target group(s): Older adults living in Little Havana at the Vista Alegre building, we focused on the area surrounding their home. Other Issues: Ensure safe mobility and safe routes for older adults to age in place and reach the things they need daily. Making the area more walkable would also help increase potential for active transportation and physical activity. Details on older people's involvement: The purpose of this project was to empower older adults to identify changes needed and voice their needs to the right stakeholders. Impact of inclusion of older adults in the process:- Empowerment of older residents led to local media coverage to address needs of creating safe walking areas for all ages- Older adults had knowledge of community strengths and community leaders that are instructive to engaging stakeholders who are instrumental in improving walking conditions- Data and involvement of older community residents have been used to inform and support policy makers in creating programs to increase physical activity across ages- Focus groups and public forum discussion assisted in the creation of a digital Resource Guide for use by community leaders to learn best practices- Understanding of their needs and interaction with the environment led to the development of an Age-Friendly Business District Little Havana- Results of the audit and older adult needs have been shared with community stakeholders and key agencies and plans for improvements are underway. Yes, we plan to expand the Business District, provide a toolkit for communities and also provide technical assistance to other communities interested in implementing similar practicies.